Name Variation Oluff Lovset was also known as Lofset. He was born in 1726 at Byneset, Sør-Trøndelag, Norway. He was the son of Ole Olsen Jorsgum and Helle Siursdatter Lovset. [S375] Norwegian National Archives Digital Archives, by Norwegian government, SAT, Ministerialprotokoller, klokkerbøker og fødselsregistre - Sør-Trøndelag, 612/L0368: Parish register (official) no. 612A02, 1702-1753, p. 23. He was born in 1730 at Byneset, Sør-Trøndelag, Norway. [S375] Norwegian National Archives Digital Archives, by Norwegian government, SAT, Ministerialprotokoller, klokkerbøker og fødselsregistre - Sør-Trøndelag, 612/L0368: Parish register (official) no. 612A02, 1702-1753, p. 26. Name Variation Bernor Lovset was also known as Lofset. She was born in 1722 at Byneset, Sør-Trøndelag, Norway. She was the daughter of Ole Olsen Jorsgum and Helle Siursdatter Lovset. [S375] Norwegian National Archives Digital Archives, by Norwegian government, SAT, Ministerialprotokoller, klokkerbøker og fødselsregistre - Sør-Trøndelag, 612/L0368: Parish register (official) no. 612A02, 1702-1753, p. 19. Name Variation Kirsten Lovset was also known as Lofset. Married Name 1740 As of 1740,her married name was Olsen. Kirsten Lovset was born in 1721 at Byneset, Sør-Trøndelag, Norway. [S375] Norwegian National Archives Digital Archives, by Norwegian government, SAT, Ministerialprotokoller, klokkerbøker og fødselsregistre - Sør-Trøndelag, 612/L0368: Parish register (official) no. 612A02, 1702-1753, p. 17. [S375] Norwegian National Archives Digital Archives, by Norwegian government, SAT, Ministerialprotokoller, klokkerbøker og fødselsregistre - Sør-Trøndelag, 612/L0368: Parish register (official) no. 612A02, 1702-1753, p. 72. Name Variation Helle Siursdatter Lovset was also known as Lofset. Name Variation Helle Siursdatter Lovset was also known as Lovset. Helle Siursdatter Lovset was born at Norway. Helle Siursdatter Lovset died after 1730 at Norway. [S375] Norwegian National Archives Digital Archives, by Norwegian government, SAT, Ministerialprotokoller, klokkerbøker og fødselsregistre - Sør-Trøndelag, 612/L0368: Parish register (official) no. 612A02, 1702-1753, p. 65. Ole Olsen Jorsgum was born in 1640 at Norway. He died in 1730 at Byneset, Sør-Trøndelag, Norway, age 90. [S375] Norwegian National Archives Digital Archives, by Norwegian government, SAT, Ministerialprotokoller, klokkerbøker og fødselsregistre - Sør-Trøndelag, 612/L0368: Parish register (official) no. 612A02, 1702-1753, p. 51. Synneve Olsdatter was born in 1768 at Innvik, Norway. She was the daughter of Ole Andersen Schaadden and Dorthe Mortensdatter. 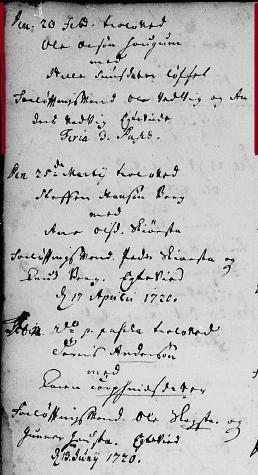 [S375] Norwegian National Archives Digital Archives, by Norwegian government, Church book from Innvik parish 1750-1816 (1447P). Married Name Her married name was Ringesetter. Siri Erichsdatter died at Norway. She was born at Norway. Elling Ringesetter died at Norway. He was born at Norway. Name Variation Rasmus Olsen Løchen was also known as Lochen. Rasmus Olsen Løchen was born circa 1745 at Norway. He and Inger Jonsdatter Langsetter were engaged on 9 July 1768 at Innvik, Norway. Rasmus Olsen Løchen died after 1801 at Norway. 1801 Løchen, Innvik, Norway Rasmus Olsen Løchen appeared on the census of 1801 at Løchen, Innvik, Norway. [S375] Norwegian National Archives Digital Archives, by Norwegian government, SAB, Innvik Sokneprestembete, Parish register (official) no. A 1, 1750-1816, p. 87. Name Variation Inger Jonsdatter Langsetter was also known as Jonsdatter Langesetter. Married Name 24 July 1768 As of 24 July 1768,her married name was Olsen. Married Name 24 July 1768 As of 24 July 1768,her married name was Løchen. Inger Jonsdatter Langsetter was born circa 1747 at Norway. She and Rasmus Olsen Løchen were engaged on 9 July 1768 at Innvik, Norway. Inger Jonsdatter Langsetter died after 1801 at Norway. 1801 Løchen, Innvik, Norway Inger Jonsdatter Langsetter appeared on the census of 1801 in the household of Rasmus Olsen Løchen at Løchen, Innvik, Norway. Ole Rasmussen Løchen was born in 1768 at Innvik, Norway. He was the son of Rasmus Olsen Løchen and Inger Jonsdatter Langsetter. Rasmus Rasmussen Løchen was born in 1770 at Innvik, Norway. He married Anna Johanisdatter before 1801. 1801 Løchen, Innvik, Norway Rasmus Rasmussen Løchen appeared on the census of 1801 in the household of Rasmus Olsen Løchen at Løchen, Innvik, Norway. Name Variation Bornie Rasmussen Løchen was also known as Borni. Bornie Rasmussen Løchen was born in 1772 at Innvik, Norway. 1801 Løchen, Innvik, Norway Bornie Rasmussen Løchen appeared on the census of 1801 in the household of Rasmus Olsen Løchen at Løchen, Innvik, Norway. Jon Rasmussen Løchen was born in 1777 at Innvik, Norway. Married Name before 1801 As of before 1801,her married name was Rasmussen. Anna Johanisdatter was born circa 1757 at Norway. She married Rasmus Rasmussen Løchen, son of Rasmus Olsen Løchen and Inger Jonsdatter Langsetter, before 1801. 1801 Løchen, Innvik, Norway Anna Johanisdatter appeared on the census of 1801 in the household of Rasmus Olsen Løchen at Løchen, Innvik, Norway. Guttorm Colbensen was born circa 1795 at Norway. He was the son of Colbeen Mathiesen and Anna Guttormsdatter. Gunilde Colbensdatter was born circa 1793 at Norway. She was the daughter of Colbeen Mathiesen and Anna Guttormsdatter. Ole Matthiasen Qvame was born in 1778 at Innvik, Norway. He was the son of Rasmus Matthiasen Qvame and Susanna Friderichsdatter Qvame. Birthe Matthiasdatter Qvame was born in 1782 at Innvik, Norway. She was the daughter of Rasmus Matthiasen Qvame and Susanna Friderichsdatter Qvame. Aleth Matthiasdatter Qvame was born in 1785 at Innvik, Norway. Gunnild Matthiasdatter Qvame was born in 1789 at Innvik, Norway. Jacob Matthiasen Qvame was born in 1790 at Innvik, Norway. Friderich Olsen Qvame married Aleth Nielsdatter. Friderich Olsen Qvame was born circa 1712 at Norway. Friderich Olsen Qvame died in 1780 at Innvik, Norway. [S375] Norwegian National Archives Digital Archives, by Norwegian government, SAB, Innvik Sokneprestembete, Parish register (official) no. A 1, 1750-1816, p. 12. Married Name Her married name was Olsen. Aleth Nielsdatter married Friderich Olsen Qvame. Aleth Nielsdatter was born circa 1716 at Norway. Aleth Nielsdatter died in 1781 at Norway. She was buried on 2 September 1781 at Olden Church, Innvik, Norway. She was the daughter of Bart Richard and Anna Barbara Uthe. Anna Christen Richard died before June 1895. [S387] Family Search; Multiple Records, "Wisconsin Births and Christenings, 1826-1926," database, FamilySearch (https://familysearch.org/ark:/61903/1:1:XRJ2-TFC : 12 December 2014), Bartholmew Richard in entry for Anna Christen Richard, 06 Jan 1895; citing Paris, Grant, Wisconsin, reference item 2 p 314; FHL microfilm 1,302,874. Bernhard Wagner died at USA. He was born at Germany. Magdalena (?) married Bernhard Wagner. Magdalena (?) was born at Wisconsin. Jacob Copple was born in March 1810 at Kentucky also reported as circa 1807. He married Margaret Blalock on 5 December 1827 at Washington, Indiana. Jacob Copple died on 12 August 1871 at Jasper, Missouri, at age 61. [S248] U.S. Federal Census 1860 U.S. Federal Census, by Ancestry.com, Year: 1860; Census Place: Jackson, Newton, Missouri; Roll: M653_636; Page: 968; Family History Library Film: 803636.